The FMI-S10 is based on their own power supply by the solar cell especially for mobile use in quality control, for quick and easy measurements in industrial environments and also well suited for outdoor applications. The extremely robust sensor module is integrated in the housing such that an optimal overload protection is accomplished by up to 500%. The measured values are in a big screen displayed either in the SI unit of Newton or in units of weight. 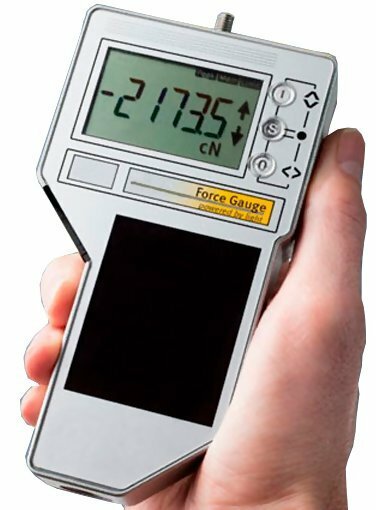 The force or pressure for train is on the M6-wave measurement, standard adapters are included. For hand-held measurements, additional handles are mounted on the housing. For this purpose, as well as for the test stand fixture, inner thread provided on the housing. The simple application of the meter FMI-S10 in combination with a high accuracy and affordability are hallmarks of this instrument.